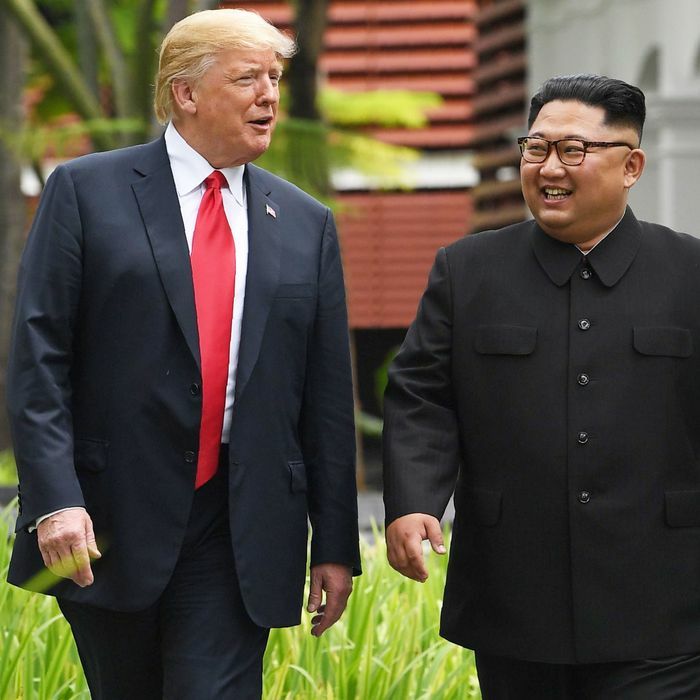 President Trump and Kim Jong-un appeared this week to mend their strained relationship, at least for the moment, with both men lavishing the other in praise and the North Korean leader making a major commitment: He will denuclearize before the end of Trump’s first term. Kim’s pledge came during a meeting with a South Korean envoy who was in Pyongyang to reopen the stalled talks regarding the North’s denuclearization. Kim reportedly complained about the U.S. negotiating in bad faith and regretted the doubts raised about his commitment to peace. But, he added, he continues to trust Trump. “He particularly emphasized that he has never said anything negative about President Trump,” South Korea envoy Chung Eui-yong said after the meeting. Trump appreciated that. Despite the warm exchange between the two leaders, it’s not remotely clear that there’s any movement being made toward North Korea’s denuclearization. Kim will meet later this month with South Korea President Moon Jae-in to talk over “practical measures” toward that goal. But negotiations have not been going well. The primary sticking point at the moment is North Korea’s desire to bring an official end to the Korean War. Despite Trump’s all-caps tweet from April — “KOREAN WAR TO END!” — that hasn’t yet happened. And it won’t until Pyongyang gives up its nuclear weapons, the U.S. says. Kim wants to sign a treaty first, but American officials fear that he’s after a propaganda win and will use the peace treaty to press for the removal of nearly 30,000 U.S. troops in South Korea. Kim believes he’s earned the trust of U.S. though and says that moves such as ending nuclear tests and destroying an underground test site should prove that he’s serious about denuclearizing. Few believe him. And his recent kind words for Trump are more about buying time than a desire to move toward giving up his nukes, one expert told the Times. “He probably saw that there was nothing good in provoking Trump,” Lee Byong-chul, of Seoul’s Institute for Peace and Cooperation, said. So he’s seeing how far he can get with sycophancy instead.